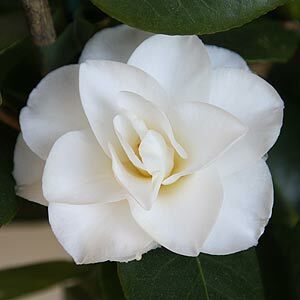 With large semi – double creamy white flowers Camellia japonica ‘Polar Bear’ is a naturally bush plant with good deep green foliage. Flowering from mid winter to spring like all camellias it prefers part shade, but not deep shade. In very deep shade flowering will be limited. Plant in a humus rich soil which is slightly acidic. Water in well with a liquid seaweed fertiliser and mulch to maintain a cool root run. Water well through the first summers and during any long dry spells for first few years. Once established, if well mulched, this is a very hardy and easy care plant. East care in the right position, Camellia japonica ‘Polar Bear’ and will have better flowers in part shade with protection from winds.